There are few places in the world more rewarding for boating and ocean kayaking than the inside passages of the British Columbia coast. One of the best loved is the Broughton Archipelago, a series of small islands set between Northern Vancouver Island and the mainland near the town of Port McNeill, at the southern end of Queen Charlotte Strait, and near tidal-charged Johnston Strait. This wilderness area can be intimidating, but with planning that takes into consideration not only the currents, but also fog, very strong winds and frigid water, the rewards of this stunning area are plentiful. Nutrient rich water is brought to the surface as the currents race through the strait, between islands, and through narrow passages. For time immemorial, a group of Killer Whales (now a designated Threatened Species) have taken summer residence in these waters, gorging themselves on the salmon runs that make their way through the Strait to numerous rivers on the south coast. Just to the southwest of this Marine Park is the Robson Byte Ecological Preserve with its famous ‘whale rubbing beaches’ (access is through special permit for scientific research). 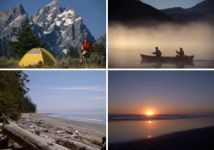 Activities in the park include all types of boating, fishing, wilderness camping, whale watching (tours available), and general nature appreciation. Vestiges of native settlements can be seen, including culturally modified trees and petroglyphs. The best examples are at the ancient village site of Mamalilaculla, which is thought to have been used for 10,000 years prior to western settlement. Middens cover many small bays, testament to thousands of years of shellfish harvesting. Facilities are very limited. Kayakers can paddle to the archipelago or utilize boat-supported tours. There are some anchorages. A full service marina is available at Echo Bay on Gilford Island. Gilford Island also has a small Provincial Park on the northwest coast. Camping is limited to tent sites, on small beaches (beware of large tides), in the forest, or on rock outcropping. Water is extremely limited, and must be filtered, boiled or carried in. There are simple open-air pit toilets located on Owl Island. Black bears do roam the islands and some caution is advised. The park is situated approximately 30 km east of Port McNeill, near the mouth of Knight Inlet. The nearest boat launches are located at Telegraph Cove, Alder Bay, Port McNeill, Alert Bay, Sointula, Beaver Cove and Port Hardy. Most kayakers paddling across Johnstone Strait put in at Telegraph Cove.